There are several ways to add products to Shop-Script, choose the one which is most convenient in a certain situation. The most simple and intuitive method of adding products is the manual method, in the "Products" section of your Shop-Script backend. if a product is available as a set of similar variants, then it is convenient to set up multiple SKUs for it, as a simple SKU list or as a combination of several feature values; read more about different SKU types. custom parameters: add them if necessary; read more about using custom page parameters. Under "Features" tab, specify additional product properties such as color, size, weight, etc. The set of available features depends on the type selected for your product. For of the available product types can be available different sets of product features, you can change their availability in section "Settings → Product types & Features". In section "Images" upload product images (photos) which you want to show to online shoppers. You can do so by using the file browsing button or by dragging image files directly from a folder on your computer. You can attach a colorful text badge to all product images to highlight a certain property of the particular product; e.g., "New! ", "Discount", "Bestseller", etc. If you do not like the default badges, add your custom ones. Under "Services" tab select the services which you want to make available for this product. Here are several examples of services: gift wrapping, personal engraving, extended scope of supply, etc. The selection of a particular service may add a certain amount to the product price or may be provided at no additional cost. Under "Related products" tab specify which products you want to be advertised on this product's page under a header like "See also" or "Customers who bought this item also bought". Read more about setting up cross-selling and upselling products. Under "Subpages" tab set up additional information pages containing more information about this product. Links to these additional pages will be available on the main product-viewing page. Here are some examples of what you may want to write about on product subpages: technical description, extra photo gallery, download links to various scanned certificates, etc. You can speed up adding of products to your online store by using the CSV import function. Add all the necessary data to a CSv file (editable with Microsoft Excel, OpenOffice, LibreOffice, or iWork) and import the file to add any number of products and product categories to your store with one automated action. The CSV file import function also facilitates updating product information when you want to change their prices, stock quantities, descriptions, URLs, features, etc. Read more about importing products from CSV files. 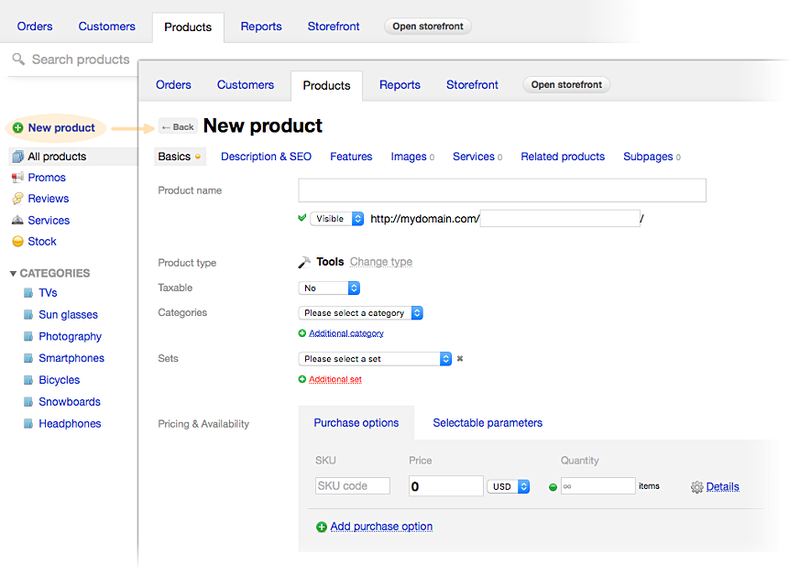 Another way of adding many new products is to prepare and upload all their photos to Shop-Script backend. The uploaded photos can be easily assigned to different products and saved in your product catalog. Read more about bulk upload of product images.